I like to grow onions from sets because it’s easier then messing around with seed germination in the freezing winter and I can usually pick sets up cheaply if I wait until the end of Spring (or buy them at Poundland). 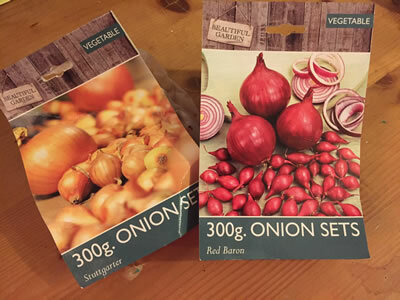 From May onwards you can usually pick up a bag of reduced Red Baron or Hercules onion sets at Wyevale Garden Centres for less than £1 (£4 originally). 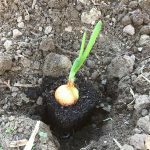 At the allotment you will no doubt have seen people putting in onions in late March or early to mid-April (which is the ‘advisable’ time) but if you want to keep planting them I’ve never had a problem putting them in as late as mid-May (I just transplanted some at the weekend). In the UK most onion varieties need 100-125 days at 14 to 16 hours daylight for the bulbs to reach maturity. In the South East 14 hour daylight days begin around mid April (this year it was the 19th April) and finish in late August (August 26th 2017). 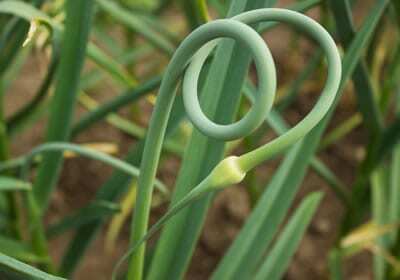 This means you can plant onion sets as late as May 18th to still get your onions 100 days of optimum ‘bulbing’ time. They may not be as big as those started by late April but they’ll be perfectly edible. 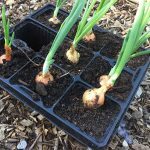 I recommend starting late onion sets in module trays of compost in the greenhouse, keep them on a bottom shelf out of direct sunlight (but not darkness), not too wet or too dry for a fortnight. They will more readily sprout leaves in the greenhouse and be away from birds that might otherwise peck them out of the ground if you were to otherwise plant directly into an outside bed. After a couple of weeks water the onions prior to lifting each cell, complete with roots and compost, before popping into your allotment bed. Remember not to cover the bulb over, the rooting system you developed should anchor it in place to stop the birds, just firm the soil around the bulb when transplanting. Once the daylight hours begin to decrease significantly you are at increased risk of ‘bolting’. Put simply, when an onion bolts, the onion bulb goes into panic mode and thinks it has no more time for growing (or bulbing) and diverts its efforts to seed production (flowering) instead. A central stem emerges with a capsule at the top of it and this will become a flower and turn to seed. The plant will begin to resemble a more traditional ornamental Allium (because an onion is a type of Allium). Note ornamental Alliums like Allium Giganteum are actually a little toxic so stick with traditional maincrop onions! 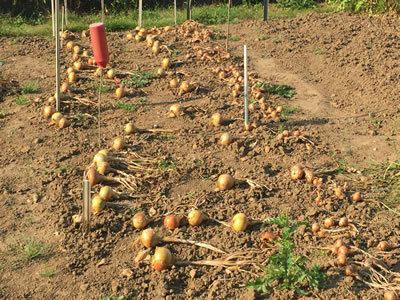 To avoid bolting try and maintain a constant environment, covering onions with a tunnel or fleece during cold spells or watering evenly during a hot dry spell. 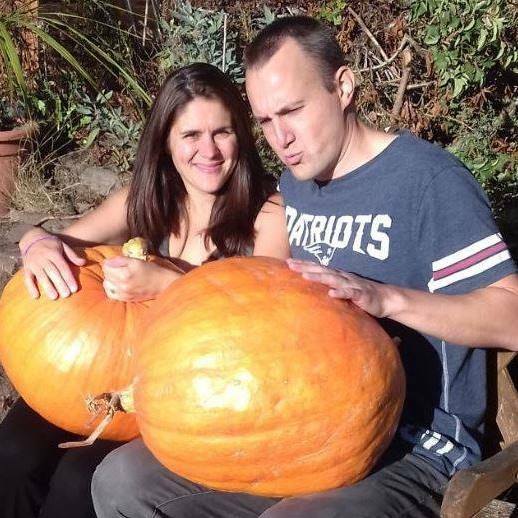 Can I still eat a bolted onion? Yes you can still eat onions after they have bolted but they don’t keep as well when harvested, your best bet is to cut off the seed head on the bolting stems and leave the bulbs in the ground until you need them in the kitchen. The bulbs won’t grow any larger but they will keep until you need them. Onions leaves turn yellow and fall over when the bulbs are reaching maturity. Once that’s happened you can lift the bulbs and leave them to dry on the surface for a day or two. I have a neighbour who does this and I always admire the sight of all those lovely onions cooking in the sun. I’ve also seen him place harvested onions into a cold frame to dry. Leaf yellowing at harvest time isn’t the same things as seeing the ends of young onion leaves turning yellow early in the growing season. That’s possibly due to a dry spell or low nitrogen & phosphorous so do feed onions with a liquid nettle compost if necessary. 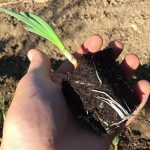 BTW Never use coffee grounds directly on onions, or any other plants for that matter, stick them in a compost heap but never directly onto a crop, the caffeine kills them off (tried it once, BIG mistake). Try your local Wilko. Half kilo bags of red and white onions have been at 30p (and regularly are towards end of April). Mine went in late too.